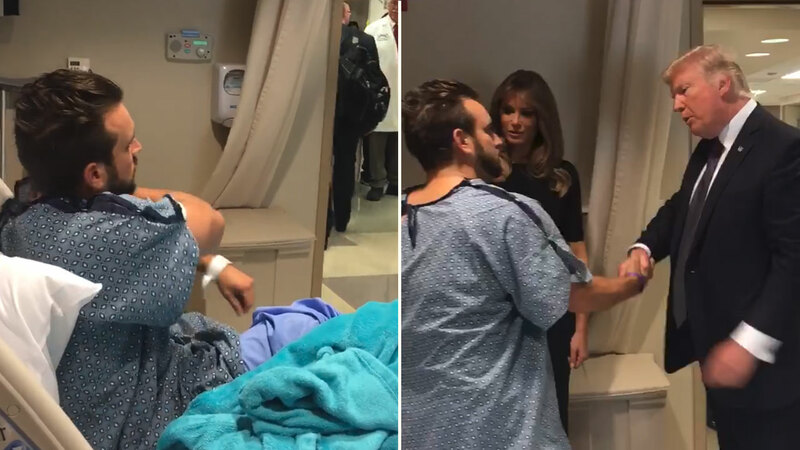 LAS VEGAS, Nevada (WABC) -- A victim of the Las Vegas shooting stood up with a gunshot wound in his leg when President Donald Trump visited him in the hospital. One of the victims. Thomas Gunderson, posted a video of him standing as Trump walks into his hospital room. "This guy looks tough to me," Trump said as he shook Gunderson's hand. The video went viral, with more than 14 million views on Facebook. "I will never lie down when the President of this great country comes to shake my hand!" Gunderson wrote in his Facebook post. "There may be plenty of issues in this country but I will always respect my country, my president and my flag. Shot in the leg or not, I will stand to show my President the respect he deserves!" Trump spent 90 minutes visiting victims of the worst mass shooting in modern US history, according to White House Spokeswoman Sarah Huckabee Sanders.